The first book EVER created by the fans as a thank you and dedication to Soundgarden. All Net Proceeds Go To Charity! Now Shipping Worldwide. Only 1000 Available! 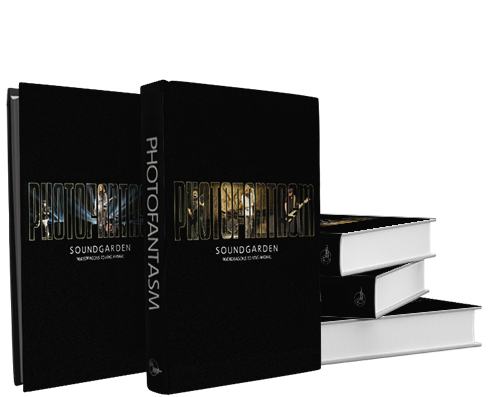 The only book EVER created by the fans for any high-profile band, Photofantasm Soundgarden: Nudedragons to King Animal is dedicated to rock pioneers Soundgarden. It features commentary and recollections from fellow artists, the music press, and other notable contributors. Photofantasm Soundgarden: Nudedragons to King Animal highlights the Seattle band's rebirth via hundreds of pages' worth of photographs, graphic art, anecdotes, interviews, and reviews. In a truly collaborative effort, fans, artists, musicians, authors, photographers, and other notable personalities all help chronicle Soundgarden's performances across the globe from 2010 to 2013. Photofantasm thoughtfully pairs content from over 300 contributors around the world, spanning more than thirty countries on six continents, providing a meaningful and visually appealing narrative as we follow Soundgarden on this journey. This book captures moments in time that will never be replicated. The moment when you first heard the band might get back together after thirteen years; when you heard the rumors that Nudedragons would open a show in Seattle and later discovered the band's name was in fact an anagram for Soundgarden; when you first saw them onstage after years of thinking you'd never see your favorite band perform again; when you felt the palpable energy of the band's chemistry reignite while their thunderous beats filled your chest; when you learned that King Animal was the title of their first new album in sixteen years, then had to endure the gut-wrenching anticipation of waiting for what seemed like an eternity for its release. No, these moments in Soundgarden's history can never be replicated, and that's why they've been documented by their fans in Photo - fan - tasm. To quote Everybody Loves Our Town: An Oral History of Grunge author Mark Yarm in his foreword to Photofantasm Soundgarden, the book is "by the fans, for the fans" and captures what promises to be just the beginning of a very long second chapter! Although Photofantasm covers the epic return of Soundgarden from Nudedragons to King Animal it transitions to present day looking forward to the band's future. Contributors, who in the spirit of this project and mutual passion for Soundgarden, shared their work and gave their time for Photofantasm. Irrespective of location and language we all have one thing in common: a deep appreciation of Soundgarden's music. It inspires us. The individual impact and experience of their music is personal to each contributor, as it is to the millions of fans that didn't have an opportunity to participate in this project. The heart of this book is a section devoted to the loving memory of an extraordinary friend and Soundgarden fan Tiffany Patterson Gross who courageously fought cancer. All net proceeds will go to Canary Foundation, the first and only foundation in the world solely dedicated to the funding of early cancer-detection solutions. Photofantasm is a thank you to Soundgarden from their fans - the Knights of the Soundtable. Artists who contributed their amazing artwork include Josh Graham, Munk One, Brad Klausen, Frank Kozik, EMEK, Maxx242, Jeff Soto, Mark 5, Gregg Gordon, Justin Kamerer, Rhys Cooper, Justin Hampton, Jermaine Rogers, Zoltron, Ames Bros, Ken Taylor, Chuck Sperry, and Lars P. Krause. In addition to the fans and graphic artists some of the other notable contributors include Meat Puppets, Mastodon, Dave Krusen, Candlebox, Pepper Keenan (COC/Down), Kevin Wood (Malfunkshun) to name just some of the musical artists; Mark Yarm author of Everybody Loves Our Town: An Oral History of Grunge and Sup-Pop co-founder Bruce Pavitt author of Experiencing Nirvana: Grunge in Europe, 1989 plus many others. Please see Facebook.com/SpoondogEntertainment for additional updates.